Ida Åberg is a PhD student in Political Science and is researching urban agriculture. But how does it work in practice? 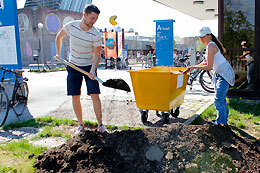 In the inner courtyard of A Building, she is now constructing an urban garden where anyone who wants to join, can. In one of the inner courtyards of A Building, four new educational pallet rims stand ready with text about which vegetables need more nutritious soil or less. 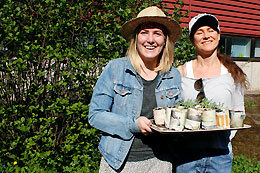 Ida Åberg (at left in picture) and her supervisor, Charlotte Fridolfson, come in carrying a tray of pea sprouts. 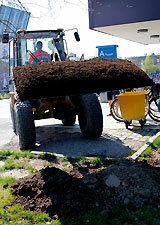 The soil is being delivered today, and the starting shot for A Building’s own agricultural garden has been fired. Because there can be problems, according to Ms Åberg. Conflicts over land use are not uncommon, and is it all right to just take water wherever and however you like? 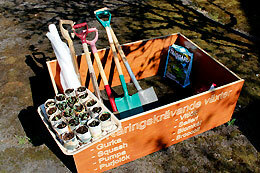 Concepts such as ‘guerilla gardening’ exist. But the agricultural garden in A Building is completely legal. “We got a permit to use the inner courtyard, the pallet rims were manufactured and donated by the workshop here in A Building, I got the soil in exchange for some snacks for a coffee break, the plants are my own or donated, and I have permission to get water from the spigot there,” Ms Åberg says, pointing at a water outlet on the wall. Urban agriculture is actually everything grown in a city, from balcony flower-boxes to gardening allotments, according to Ms Åberg’s definition. But not, perhaps, if you ask the ‘real’ urban gardeners. The idea is that everyone helps with the gardening – watering a little, clearing a few weeds, and tasting one of the vegetables when you feel like it. Attendance today isn’t massive. Truls Löfstedt, PhD student at the Division of Information Systems in the Department of Management and Engineering (IEI), has joined because he thinks it’s cool, and contributes the strength of his arms when the soil is to be loaded into the yard. Charlotte Fridolfsson is Ms Åberg’s supervisor, and also thinks the project is great fun. Everyone is warmly welcomed to visit the garden.